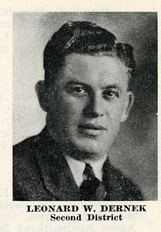 Dernek, Leonard W. 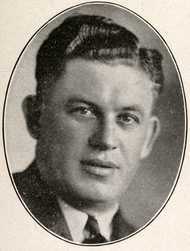 "L.W., Len"
He died, after suffering a stroke, at St. Mary's Hospital in Olmsted County, Minnesota. His funeral was held in the Cathedral of the Sacred Heart in Winona, Minnesota on July 11, 1961. 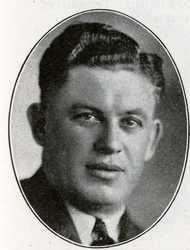 He was buried in St. Mary's Cemetery in Winona, Minnesota. He was a member of the Cathedral of the Sacred Heart Church in Winona, Minnesota. In Memoriam: Senators Alfred Berglund, Colvin G. Butler, Sherman W. Child, Leonard W. Dernek, H.C. Hanson, John A. Johnson, Charles Klein, Martin M. Malone, Nels A. Pederson, Herbert Rogers, et al. State of Minnesota Senate Chamber, April 3, 1963.